St Kilda is an inner suburb (neighbourhood) of the metropolitan area of Melbourne, Victoria, Australia, 6 km south-east of Melbourne's Central Business District. 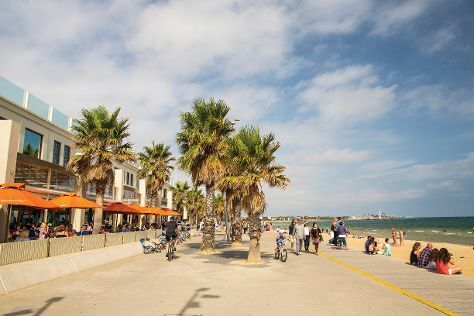 Kick off your visit on the 6th (Mon): take an in-depth tour of Jewish Holocaust Centre, tour the pleasant surroundings at Brighton Beach, enjoy the sand and surf at St. Kilda Beach, then grab your bike and head to Catani Gardens, and finally take a leisurely stroll along St Kilda Pier. To see photos, more things to do, maps, and more tourist information, you can read our St Kilda trip planner . If you are flying in from United States, the closest major airport is Melbourne International Airport. January in St Kilda sees daily highs of 79°F and lows of 59°F at night. Finish your sightseeing early on the 6th (Mon) to allow enough time to travel back home.